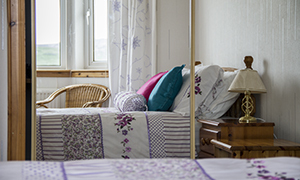 The twin room works well as a supplement to the Double room for a family. 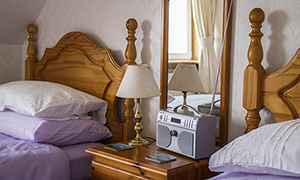 Both rooms have hospitality trays, hairdryers, radio alarm clock and various toiletries. No parties allowed in bedrooms. T.V. viewing is in the lounge. 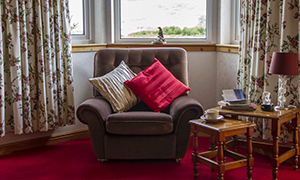 The house boasts of a conservatory/sun lounge for relaxation, with books available to help you decide on places to visit, short walks and maps for the more challenging routes. Click on an image above to see further details. On offer for breakfast is an extensive menu. This consists of bacon, sausage, local eggs, tomato, award winning Stornoway Black Pudding. Scrambled Poached or Boiled eggs. Porridge made from Scottish Oatmeal. Special Dietary requirements please let me know in advance. Ground Coffee, teas, herbal teas, drinking chocolate. Packed lunches can be arranged provided prior notice is given. Laundry service is available – price dependant on loads. Drying green available for wet outer garments etc. There is an extensive parking area for cars and motor cycles. Check in times are normally between the hours of 4.30pm and 6pm. If however you expect your time of arrival to be beyond 6pm it would be good if you could let me know on the day. It would be good on the day of your departure if rooms could be vacated by 10.30am. Thank you. A no smoking policy is in place throughout the house. To make an enquiry click here. Come and visit this established Bed and Breakfast in the picturesque hamlet of Fernilea. Click on a link and join us on your social network of choice.